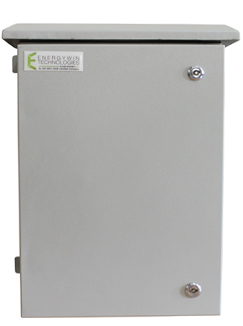 Energywin's solar water pump controller is an efficient, low-maintenance and economical option for livestock, agricultural, recreational and residential applications. With rising prices of diesel and the vagaries in agriculture power supply situation many farmers have been considering solar energy as an alternative. 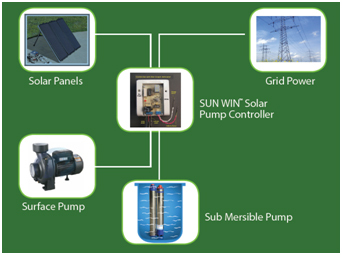 Interestingly customers are seeing solar pumps as both pumping and an energy solution. The solar pump controller is well suited to cover the needs of smallholder farmers as it is an affordable irrigation technology for individual use that combines environment-friendliness and low maintenance costs with income, productivity and labor-saving benefits. Dual Input source selection (Grid and Solar). Integrated MPPT technology with 99% accuracy. Protection against input lighting surge, over load, dry run, etc. Compatible with wide range of pumps ranging 1HP to 15HP. Suitable for both submersible and surface pumps. Indicators for RYB and solar availability. Manual by pass switch to grid. Low maintenance cost and easy to install. Online monitoring system with GSM-GPRS modem. Monitoring parameters include water discharge in litres, PV voltage and string current, mains voltage and current.